This delightful book was late in coming to our notice. 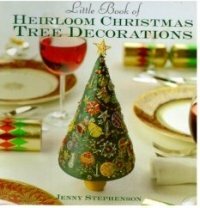 One of the "Little Book" Series, it describes in detail how to make an exquisite, silk, miniature tree with a profusion of decorations. Rajmahal is used in abundance, along with several other threads. Click the button below to add the Christmas Tree Decorations to your wish list.